Grandeur of the Seas returned to regular service today in Baltimore, leaving tonight with an enthusiastic crowd aboard. But not everyone was that happy. Left behind were approximately 134 people whose staterooms were unavailable. The Alaska State Troopers report they processed an allegation of sexual assault on a 12-year-old girl which occurred aboard Celebrity Century after the ship left Ketchikan on June 28. The US Coast Guard came through once again with an unusual Medevac in Alaska today. Cruising through Glacier Bay is going to be a little more leisurely beginning on Saturday. The National Park Service reduced the speed limit in Glacier Bay National Park for all large cruise ships. It will be 10 knots per hour until further notice. Royal Caribbean's Grandeur of the Seas returned to its home port in Baltimore this morning at the conclusion of a one-night preview cruise for local travel agents. It resumed regular service with this afternoon's sailing (JJuly 12, 2013). As the ship sailed by Ft. McHenry this morning, it hoisted the flag bearing the US Navy motto, "Don't Give Up the Ship." And because it’s such a big deal, MSC is pulling out all the stops to celebrate MSC Divina’s maiden cruise from Miami. Tourism officials from Grand Cayman are headed to Miami to talk with cruise lines about the government’s plans to build cruise ship berths on the island and to try to convince the lines to keep Grand Cayman on the schedule, for at least some of their ships, while the new berths are being built. Grandeur of the Seas leaves dry dock in Freeport on Tuesday (July 9, 2013) showing the stern area repaired from the May fire damage. With repairs completed from its May 27 fire, Grandeur of the Seas returned to Baltimore yesterday, its year round home port. After the early morning fire, Grandeur sailed under its own power to Freeport where passengers disembarked and were flown home. Repairs have been underway since at the Grand Bahama Shipyard at Freeport. No cause of the blaze has ever been released. Grandeur left Freeport on Tuesday. The ship is hosting a one cruise for travel agents from Baltimore tonight. Her first passengers will board on Friday (July 12, 2013) as scheduled. 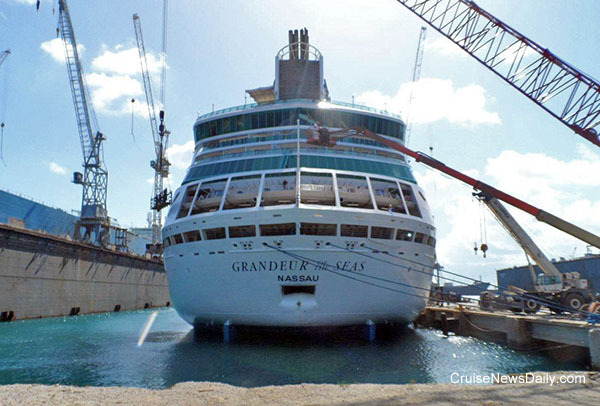 We have a photo on our blog of Grandeur of the Seas leaving the yard at the completion of repairs on Tuesday. MSC Cruises confirms that former UK & Ireland Managing Director Giulio Libutti has left the company by mutual agreement. After 5 years of committed leadership, the company would like to thank Mr Libutti for his hard work and wish him every success in future endeavors. The company also confirms that Giles Hawke has been appointed as the new UK & Ireland Managing Director and will take up this position on November 13, 2013. Giles Hawke spent nine years at Crystal Holidays and a year at Highlife Breaks before joining Carnival UK. He was at Carnival UK for nearly eleven years, the last six of which were spent in the role of sales and customer service director. “We are confident that Mr Hawke will be an excellent addition to MSC Cruises UK & Ireland and look forward to welcoming him on board,” said Pierfrancesco Vago, CEO of MSC Cruises. In the interim, MSC Cruises’ strong management team and its highly qualified and committed employees will continue to develop the MSC Cruises brand in the UK, overseen by MSC Cruises Corporate Executive Neil Palomba. If new ships and additional capacity fuel the industry, Regent Seven Seas did their part today by ordering a new luxury vessel from Fincantieri today. The 54,000-ton ship, which will be Regent’s largest, will carry 738 passengers (double occupancy) and be named Seven Seas Explorer. Halifax (NS) is the latest port that wants to provide shore power to cruise ships calling there. Actually, the plan to offer it beginning next year was already put in place back in January, but now the power company is working out what to charge cruise line customers and formally proposing a tariff for approval. They seem to be taking a different approach than their counterparts in most ports. Regent Seven Seas Cruises announced today they have ordered a 54,000-ton cruise ship for delivery in the summer of 2016. The new ship will be named Seven Seas Explorer, and be built by Fincantieri in Italy. Seven Seas Explorer will carry 738 passengers. The specs call for hull length of 732 feet and a beam of 102 feet with a 23 foot draft. Additional details will follow in the complete story which will appear in today's edition of Cruise News Daily. The boom in world cruises continues, and Oceania’s entry into the 2015 market is an incredibly impressive one - a 180-day (that’s like six months!) complete circumnavigation of the globe from Miami. CND subscribers also read about QE2 getting ready to sail ... and the Schettino trial is delayed. A sunken tugboat in the Mississippi River disrupted Carnival Conquest’s turnaround in New Orleans yesterday making for a last-minute change in travel plans for thousands of Carnival passengers. It threatened to do the same with Carnival Elation’s turnaround today, but the Coast Guard reopened the river in time for Elation to turnaround with a delay, but not a long enough one that it would affect the next cruise’s itinerary. China is indeed shaping up to be the new battleground for passengers among the international brands of cruise lines. It is a vast, virtually untapped market that is quickly proving itself quite profitable. Cruising has proven very popular with the Chinese with most lines marketing there experiencing rapid growth. The latest line to jump into the market with both feet is Princess Cruises which today opened five offices in China. 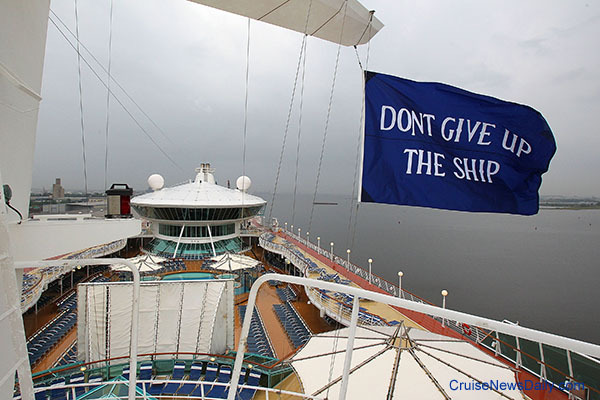 CND subscribers also read about a passenger falling from a balcony on Carnival Magic ... Tropical Storm Chantal in the Caribbean ... Costa Cruises doubling capacity in China ... and Disney Magic's return to Venice.